The Settlements near the Local Community Health Centers (LCHC) may have a negative impact on the settlement environment, especially is air quality due to the transportation sector near LCHC and community activities around the LCHC. 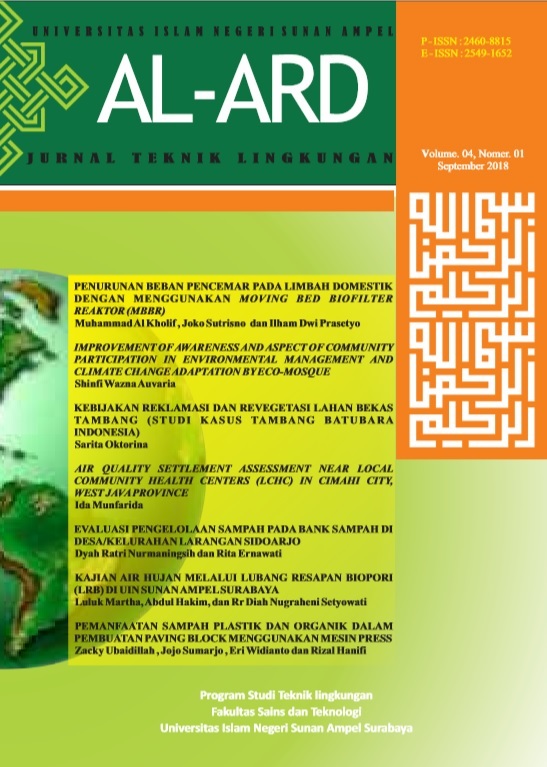 This study evaluated air quality in three Settlements near the LCHC in Cimahi City, West Java Province, among others were: settlements in Cimahi Selatan, Cimahi Tengah and Cimahi Utara Districts. The air quality parameters were Nitrogen Dioxide (NO2), Sulfur Dioxide (SO2), Carbon Monoxide (CO), Ozone (O3), and Total Suspended Particulate (TSP) at three Locations of the Settlement. Air Quality Evaluation results indicate that all gaseous parameters were below air quality standards based on Government Law No.41 Year 1999 about Air Pollution Control, but Total Suspended Particulate (TSP) concentration in settlements of Cimahi Tengah and Cimahi Selatan Districts have exceeded the standard. However the lowest gaseous concentration was found in Settlement of Cimahi Tengah District. The community can play a role in improving the air quality in the settlements by providing green open space. Keywords: Air Quality, Local Community Health Centers (LCHC), Settlement.